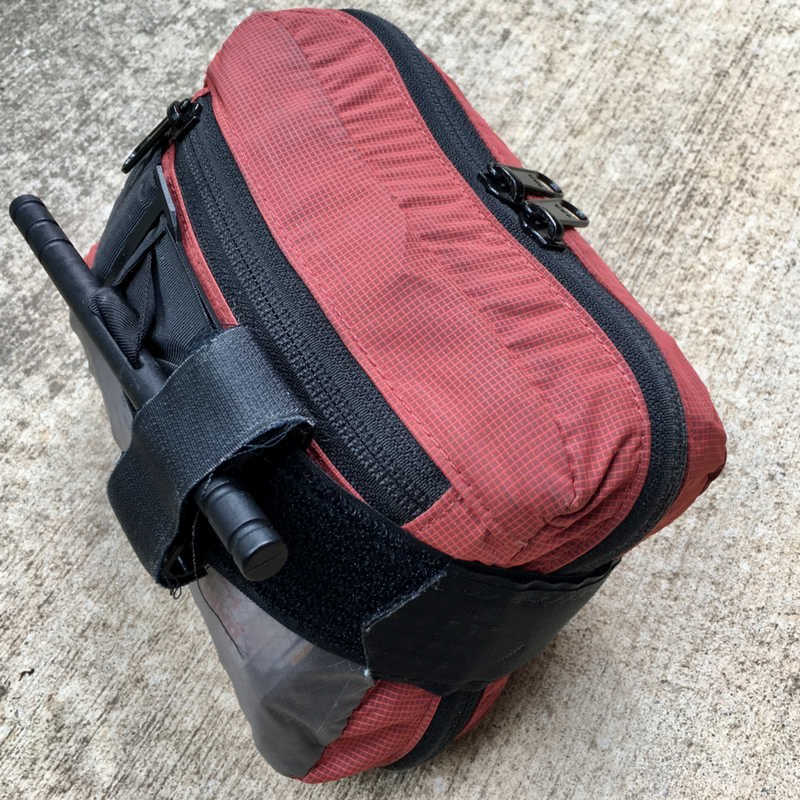 This week Rich and I talk about our EDC bags and the stuff in them. Justin's Drink: Two Roads Lil Heaven "Crushable India Pale Ale"
Our bags aren't dedicated "bugout bags" or "go bags" or whatever. They are bags that mostly contain stuff we use on a daily basis. There is some emergency equipment in here, but outside of a couple of very specific items, these are things that are multi-purpose to support our day-to-day lives rather than survival daydreams. This has to be a bag that you will actually carry! It doesn't do you any good to have this stuff in a closet at home. Avoid loading it down to the point that you won't carry it. The bag should be tailored to your lifestyle. If you travel a lot by air, it should accommodate air travel. If you travel a lot by car, it should be tailored for vehicle travel. Whether you live in the city or country, it should be geared toward your environment. It should be a generalist bag filled with multipurpose items. Avoid overtly military-looking bags if possible. A backpack is preferred as it is the most easily carried and allows your hands to be free. If you work on a construction site, choose bag that can carry your lunch. Don’t buy a backpack that is too big. You’ll fill all that space with stuff, and become less likely to carry it. This module is intended as a replacement for my wallet. Passport and passport card: we like this form of identification for several reasons. First, it is federally issued and should be accepted everywhere. Secondly, it has a long expiration period (10 years). Thirdly, it does not contain a home address, so if you lose your bag, it will not lead a thief back to your home. Don’t forget to protect these items with an RFID-blocking sleeve. Change - $5 to $10 in coins. Coins are invaluable if you have to feed yourself from vending machines, pay for parking or tolls, etc. $50 in 1s (10), 5s (4), and 10s (2). Small bills, again for vending machines, parking, tolls and small purchases. Duplicate ATM card (preferred) or credit card. Remember to protect these with an RFID-blocking sleeve. Keys. Spare keys for your car and home at a minimum. You may also consider a spare key for gun cases, storage lockers, etc. 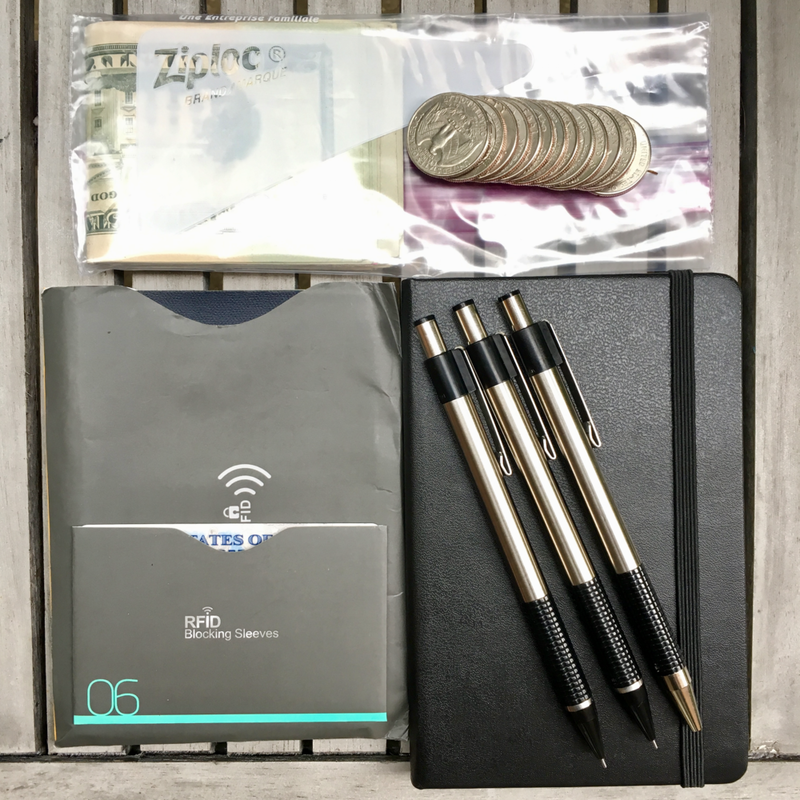 Note-Taking Gear. For me this includes 2 pens, 2 pencils, and a notebook. Corsair Survivor - the most durable of the bunch, but also the largest. Kingston Data Traveler - this is an excellent option for key-chain use. Sandisk Ultra Fit - the smallest of the three listed here. Admin module contents. Note that some items are omitted for security reasons. Aux Cable. I keep this for use in rental cars so I can listen to audio without risking data transfer to the car. Port-A-Pow Data Blocker. This accessory allows you to charge your phone from a USB port without risking inadvertent or surreptitious data transfer. Sandisk Ultra-Fit 128-GB USB Flash Drives (x3). These allow me to have various backups of data from my computer. Anker Powerline USB to Micro USB, for charging my Anker Astro battery pack. Battery case, contains two AA and three AAA batteries. Note that on the podcast I said this product is watertight - IT IS NOT WATERTIGHT! 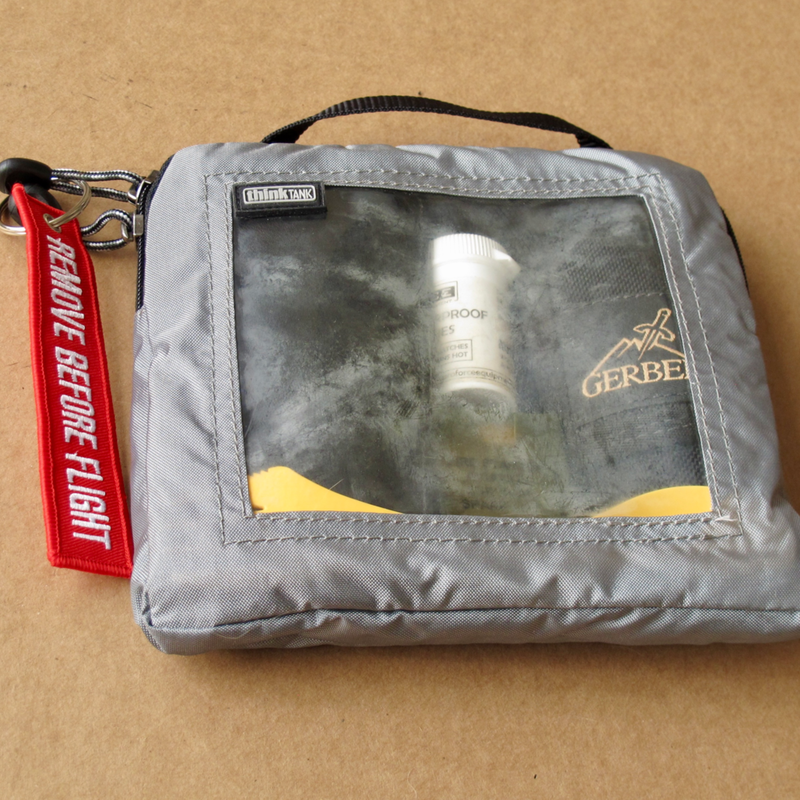 Contents Part III: "Remove Before Flight"
IMPORTANT NOTE: If you carry firearms/ammunition, knives, and other prohibited items in the same bag that you may travel with, keep those items inside of a separate, sealed compartment that you can easily remove. This helps to ensure that you won't forget ammunition or firearms in your bag, even though the TSA misses up to 95% of contraband. Some first aid equipment is probably the most versatile equipment you can have. You are much more likely to encounter a medical emergency than you are nearly any other kind of emergency. Katadin MicroPur water purification tables (Justin). I added these after recording and realizing I had no water purification tools in my bag. 2x Payday bars. See this link comparing the Payday bar to some of the most expensive (yet disgusting) “survival” bars. All of this fits neatly into a single quart-sized Ziploc bag, and this is enough food to keep me functional for a couple of days if I stretch it. Warming layers: At a minimum we feel you should have a warming layer like a fleece or packable down jacket/vest, a hat, and gloves, and/or a neck gaiter. Inclement weather gear: a rain jacket or poncho. A full change of clothing: Justin often carries a full change of clothing because of his extensive travel schedule.